Skirts are being rocked by millions of ladies around the world. Regardless of the style, print or color, this clothing piece manages to create astonishing looks. 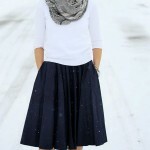 I am in love with one particular design – a full skirt. I am pretty sure that many of you also share my affection, which is not surprising at all. This article of clothing is capable of drawing the most elegant and exquisite images ever. Yet, it is very important to style such an item in a right way; otherwise you might end up with a ridiculous or unstylish look. Below are some tips to provide you with enough knowledge and expertise in this significant and actual question. If you can’t stand the gray and gloomy shades of winter, then you ought to create a similar look. This adorable full high waisted skirt in violet fuchsia perfectly goes with the plain turtleneck in black, lovely multi-colored and printed scarf and black biker jacket. The super trendy and gorgeous leather low-heeled boots in rust brown as well as the cute handbag in beige and rust add a saucy zest to the outfit. In case you prefer more moderate and dim looks, here is something that you will definitely fall in love with. The chocolate brown suede coat looks gorgeous against the glimmering mid-ankle skirt in black leather. A pair of black tights along with the matching ankle booties, knit beret, gold-buckled belt, cute clutch and saucy scarf in ash gray made this outfit look incredibly astonishing and superb. 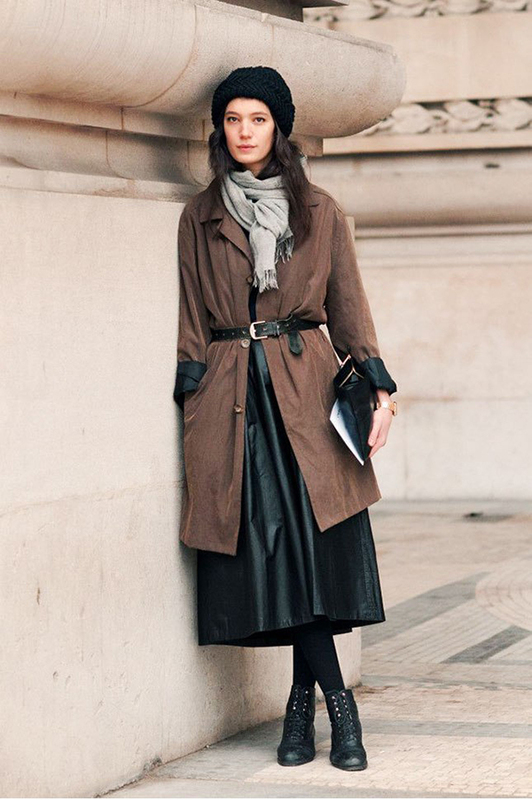 I would totally opt for such an ensemble, as it is full of Parisian vibe. Fans of grunge and rock, cheer up, for here is the most astonishing look ever. This dark red textured skirt will be the brightest spot during these days, for sure. Especially, when it is styled in such a cool and stylish way. Black leather jacket along with studded and lace-up chunky boots make a perfect match for the lovely skirt. Black sunglasses, matching tights and a glistening minaudiere in silver and mother-of-pearl completes the funky look. Here is an adorable outfit designed in a boho style. A cream skirt in midi length is combined with a beautifully embroidered knit sweater in purple. The striking cashmere coat in coral red is embellished with delicate and fluffy fur. The wide-brimmed hat in trendy burgundy as well as the high-heeled leather boots in black finish the saucy ensemble. Check out this very sophisticated outfit that will blow your mind away the moment you spot it. The flare jacquard skirt in white is paired with a sequined and glossy black top featuring a polka dot pattern. The lovely knit cardigan in gray and black fits into the ensemble in an excellent way, while a pair of trendy black ankle booties, cool glasses and a statement necklace complemented the adorable outfit. You can mix your favorite full skirt with some sporty hues that are so much in vogue this season. This rust brown leather mid-ankle piece looks drop dead gorgeous when paired with the turquoise crop bomber. The printed beige blouse beneath the jacket is an excellent complementary piece to the look. A gorgeous handbag in tan as well as matching lace-up booties make this outfit even more appealing and cool. There is also an adorable way to style such a skirt with a pair of flat and comfy boots – which is very actual if you have to be on your feet all the day long. 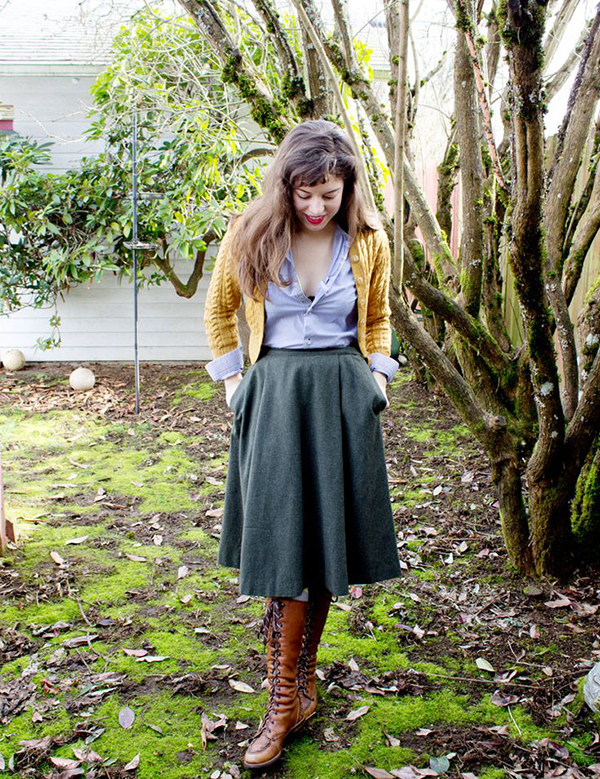 These dark brown lace-up boots perfectly match the light violet unbuttoned shirt, knit cardigan in yellow and dark green full skirt with pockets. This is quite a unique and unexpected combination, but as you can see, it worked out in a gorgeous way. So there is no need to limit your imagination and constrain your fashion taste at all. Finally, comes the most formal and wear-to-the-office look. A black high waisted flare skirt with a wide belt is combined with an elegant skimming top in tan. A cute necklace in a contrasting shade as well as a pair of glossy and incredibly trendy thigh-high boots make this outfit extremely hot yet sophisticated. There is nothing else that you need to add here – nothing except for a saucy handbag. If you feel like looking alluring and elegant, this would be the excellent choice for you. 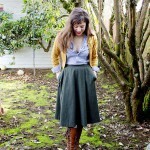 Besides, with such a skirt you will be able to create many other looks as well. 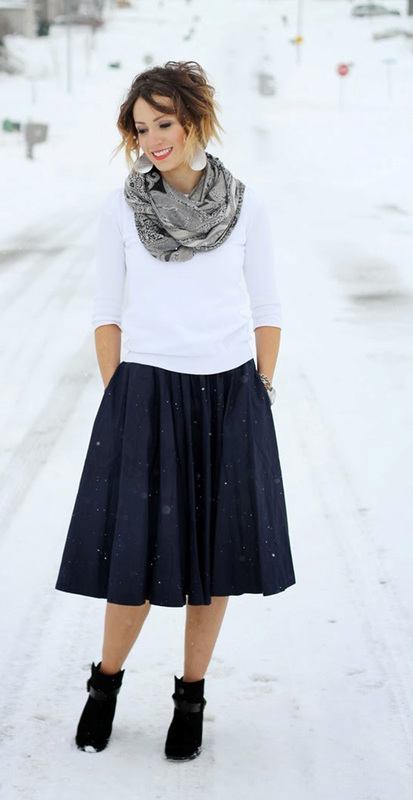 There are some more ideas that will reveal the perfect combination of boots and a full skirt. Browse through the gallery and choose the one that you like the most.